Piezoelectric materials, which generate an electric current when compressed or stretched, are familiar and widely used: think of lighters that spark when you press a switch, but also microphones, sensors, motors and all kinds of other devices. Now a group of physicists has found a material with a similar property, but for magnetism. 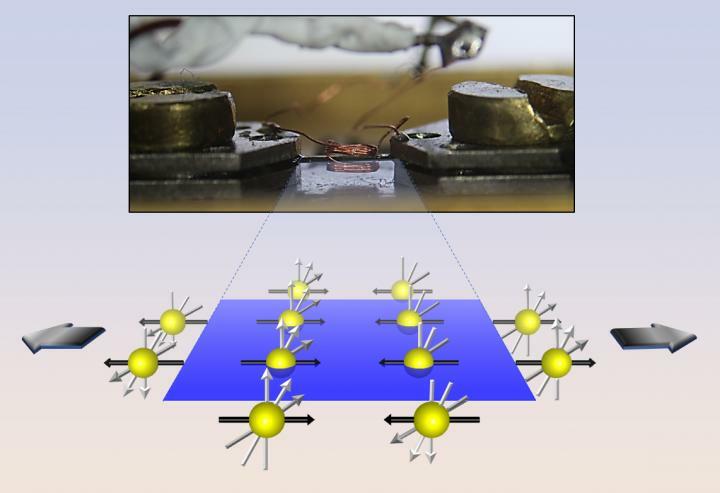 This "piezomagnetic" material changes its magnetic properties when put under mechanical strain. "Piezomagnetic materials are rarely found in nature, as far as I'm aware," said Nicholas Curro, professor of physics at UC Davis and senior author of a paper on the discovery published March 13 in the journal Nature Communications. Curro and colleagues were studying a barium-iron-arsenic compound, BaFe2As2, that can act as a superconductor at temperatures of about 25 Kelvin when doped with small amounts of other elements. This type of iron-based superconductor is interesting because although it has to be kept pretty cold to work, it could be stretched into wires or cables. BaFe2As2 is what is called a "nematic" crystal because its structure goes through a phase transition before it becomes superconducting. In the case of BaFe2As2, its crystal structure goes from a square to a rectangular configuration. Curro and graduate students Tanat Kissikov and Matthew Lawson were attempting to study the material by nuclear magnetic resonance (NMR) imaging while stretching it, to see if they could force it into the rectangular configuration. To their surprise, the magnetic properties of BaFe2As2 changed as they stretched it. The material is not a bulk magnet – the spins of its atoms point in alternating opposite directions, making it an antiferromagnet. But the direction of those magnetic spins does change in a measurable way when under stress, they found. "The real surprise is that it appears that the direction of magnetism can change and come out of plane," Curro said. At this point, there's no theory to explain these results, Curro said. His lab is looking to see if other materials can show the same behavior and if mechanical strain can affect the superconducting properties of the material (these experiments were not carried out at temperatures where BaFe2As2 is a superconductor). The discovery could have applications in new ways to look for strain within materials such as aircraft components, Curro said. Other coauthors on the paper are Rajib Sarkar, Institute for Solid State Physics, Dresden; Blaine Bush, UC Davis; Erik Timmons, Makariy Tanatar, Ruslan Prozorov, Sergey Bud'ko and Paul Canfield, Ames Laboratory, U.S. Department of Energy and Iowa State University; and R. M. Fernandes, University of Minnesota, Minneapolis. The work was supported by NSF and the U.S. Department of Energy Office of Science. The Ames Laboratory is operated for the U.S. Department of Energy by Iowa State University.